The region of the Lys and Yser rivers is highly urbanised and the municipalities have to deal with the considerable risks of flooding. The LYSE project wants to move towards integrated management of the flood risk through a number of cross-border measures. 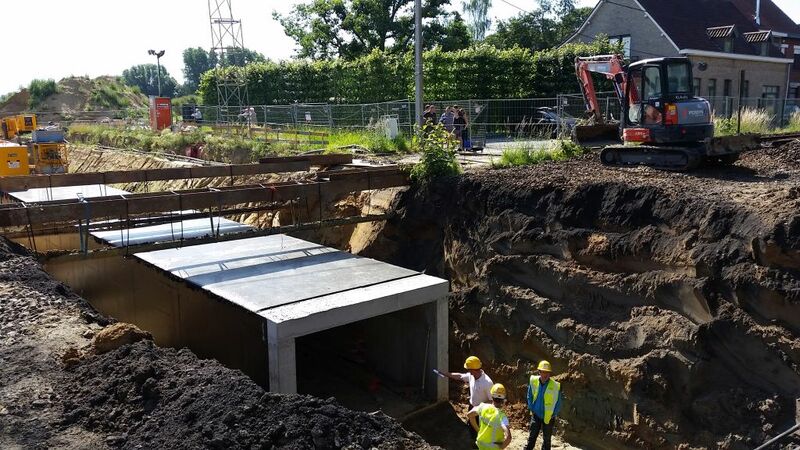 As part of this project, VMM is building a bypass that redirects the Heulebeek waterway around the town centre of Heule. A cross-border approach that offers answers to the flooding problems is of critical importance, because the waterways do not stop at the border. creating a network between partners to coordinate actions and to discuss the various techniques and methods that need to be implemented to protect the inhabitants against flooding. The centre of Heule has already experienced excessive water levels in the past, and measures to protect the city against flooding became a critical issue. The flow capacity through Heule simply could not be increased. By digging a new bypass, a portion of the flood water can be channelled around the bottleneck. A conduit will also be built to allow the water to pass underneath the railway line. Below is a short video of the conduit (slowly) being pushed through. The critical moments were also captured with photos.